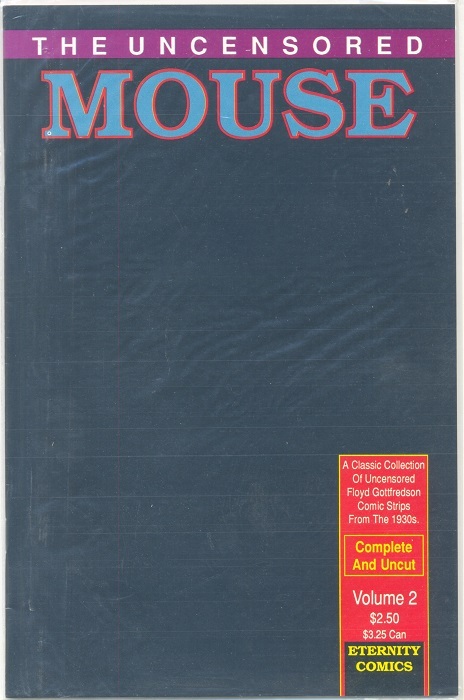 Back Issue of the Week: The Uncensored Mouse #2 (April 1989). Discovering that the early Mickey Mouse newspaper strips from the 1930s had fallen into the public domain, Eternity Comics began a reprint project of those strips by legendary Mickey artist Floyd Gottfredson. The “Uncensored” part of the title came from the fact that these early strips presented a Mickey who was a little rougher around the edges than we all were used to, as well as featuring characters and situations that, in modern eyes, could be potentially offensive. The solid black front cover did not mention “Disney” or “Mickey Mouse” at all, and the entire comic was sealed in a plastic bag to prevent anyone from peeking within and witnessing the naughty antics of Mice Gone Wild. It may come as no surprise that the Walt Disney Company was unamused by this particular publishing effort, and after some legal wrangling, the series was cut short with the second issue, pictured above. You can read more about what happened right here. These strips were later reprinted in the officially-sanctioned Walt Disney’s Mickey Mouse series of hardcover collections from Fantagraphics Books, but Uncensored Mouse remains as an interesting artifact of 1980s comics publishing. This entry was posted in Back Issue of the Week on September 22, 2016 by Mike.